The Chandlery – from beginning to finish! At the start of 2011, Hazle wanted to add a new corner building to our Nation of Shopkeepers Collection, and for the first time, we followed it’s progress step by step in an online blog. We loved receiving collectors’ comments and input, and we hope that those of you who have bought a chantry will enjoy following it’s progress into the world. Below: our blog on the progress, week by week. It’s time for Hazle to add a new building to our Nation of Shopkeepers range! There has been lots of discussion in the workshop, with each of us (and collectors too) putting forward buildings that we would love to see! Hazle has considered and visited a number of ‘possibles’ some of which hopefully we may see later in the year, but for now she has settled on a building in a small town which she and Stephen visited in 2014, and which made a big impression on them both. For now we are keeping details of our new addition under wraps, but as a teaser can you work out from these clues where our new building is situated? This little town has a population of around 3000. It was the site of an English Civil War Battle. It is home to more than one annual international festival. You can enjoy boat trips here, local walks or visit a vineyard. This town hit the news when it was flooded. Well done to those of you who emailed us the correct answer! For those who didn’t guess, Our chosen town is Upton upon Severn, an attractive little town with a long history, and a beautiful selection of historical architecture! Hazle has taken the pictures, and the measurements, and is busy working on the first NEW ceramic to join our collection in 2011, and it is a delighful and unusual little corner building from Upton upon Severn. This building is known locally as Oak Apple Cottage, and is currently operating as an Estate Agency. The wonderful projecting upper storey of the building was the feature that caught Hazle’s eye, and she could quickly see it becoming a valued part of our range. This week we have been missing Hazle’s present in the workshop, as she works on the scale drawing of the building, which will become the template from which to create the first clay ‘blank’. It is Hazle’s skill and experience of technical drawing which makes our buildings unique as a collectable, and gives each one the detail which makes them so true to the original buildings. Check back next week for the next stage in the process. When the drawings have been completed, Hazle uses these as templates to create a clay ‘blank’. The drawings are cut out, and laid onto thinly rolled out clay so that Hazle can cut the shapes that make up the layers of the building. These thin layers are then built up onto a ‘background’ layer of clay. Our shopfronts can have anything from three or four layers upwards! From the moment Hazle starts sculpting the clay blank, the clay begins to slowly dry out, so it is not a task that one can take a break from! 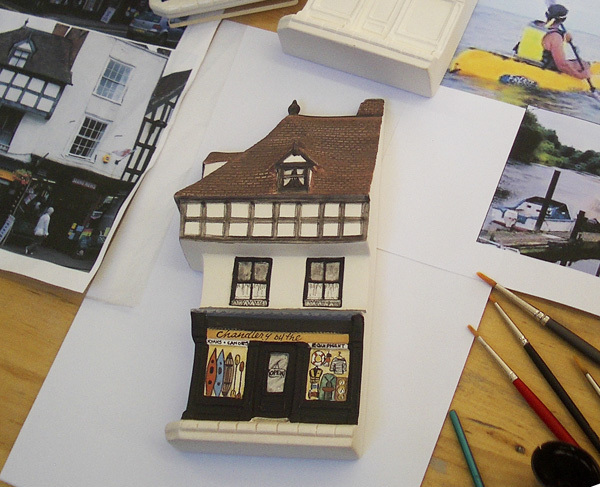 Hazle can create a fair amount of detail as this stage, but the fine details which make our ‘Nation of Shopkeepers’ range so special are not sculpted in until the next stage….. So check back next week for our latest update! 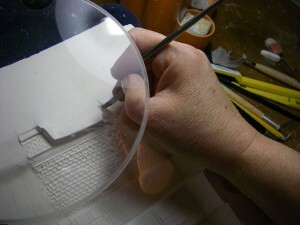 This is where the very fine detail begins to be worked into the building. The clay model has a ‘wall’ of clay built around it, then it is very carefully covered in fine plaster of paris. There is a real art to mixing and pouring the plaster, if there was a even tiny bubble in the plaster, this would show up on the finished ceramic. 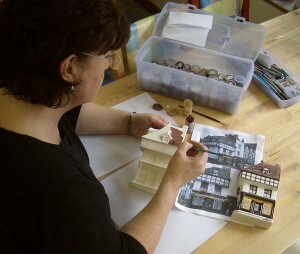 Once the plaster has dried, it is removed from the clay model. 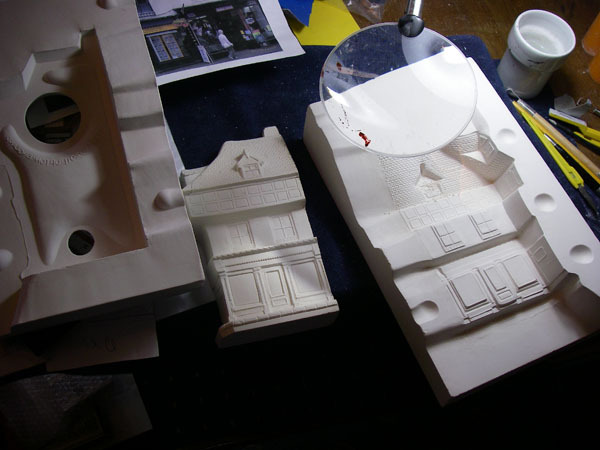 Fine plaster is an excellent sculpting medium, and Hazle can now create the small quirky or historical features that make our buildings so special. 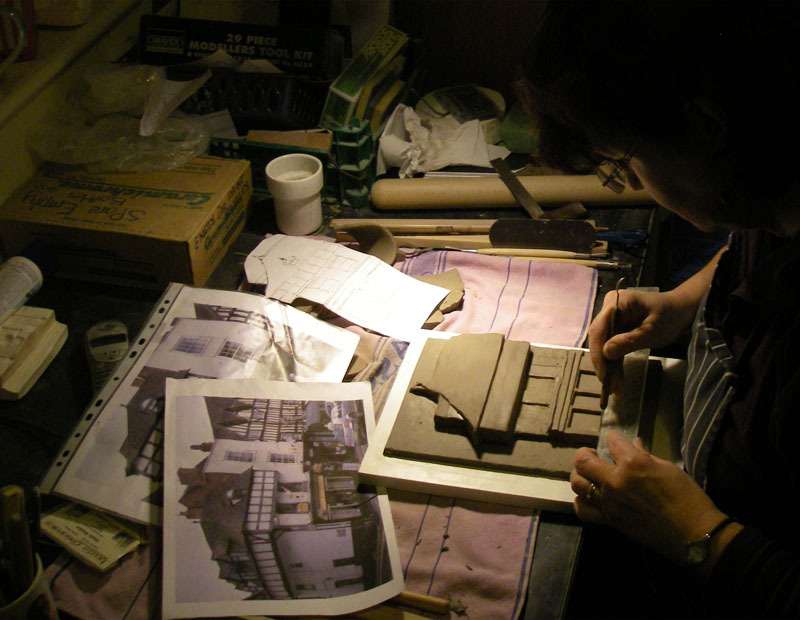 As this first plaster cast is the reverse of the original clay model, she carves in to the plaster those features which will on the finished building stand out! 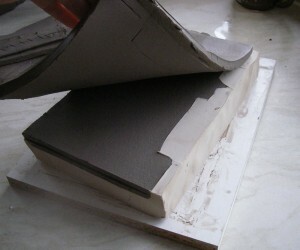 Once Hazle is happy with this first level of sculpting, the plaster model is rendered waterproof by applying soft soap, then it is covered with more fine plaster. It is a nerve wracking moment when the two plaster casts are taken apart! Plaster, of course, does not stretch or bend like clay, any ‘undercuts’ in the model, and the two will refuse to separate! Once the two are apart, Hazle can use the ‘positive’ model to carve into. Hazle can go back and forth three or four times, casting first a negative and then a positive plaster model, sculpting at each stage, until we finally arrive at the ‘positive’ that will be used to create the ceramic moulds. If you think that the plaster models look larger than life, you are right! clay shrinks as it is dried and bisque fired, so the model, and the moulds that will be made from it are one tenth bigger than the finished ceramics. At last the sculpting is finished, and the plaster model – which looks exactly as the finished ceramic will, except bigger, is carefully packed and sent to our mould makers. From time to time we trust models to the post, but generally, after all the hours of work that has gone into it Hazle prefers to drive it up to Stoke, and deliver it herself. 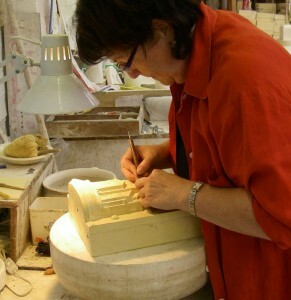 Stoke is still the heart of the British ceramic industry and the place to find experts who can create the moulds that we need. Our model makers are experts, who have spent all their working lives in the ceramic industry, and over the years have become as much a part of the team as the artists and workshop staff. Here we see Hazle on a visit to Stoke, making a final small adjustment to one of our master moulds, this is the first mould created, and the mould that goes on to produce working moulds for us to use. Hazle generally finds one or two details to improve or to add to it. This new ceramic has a pinnacle on the roof, which we can see Hazle adding in to the mould. Then we cast a very few samples from it – partly to show us anything that could be improved on, and partly because we can’t wait to see our new addition for the first time! 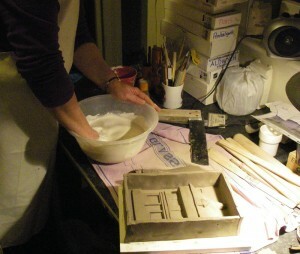 Once we have our samples, it is time to pack it up once again, and send it to be used to create the working moulds. We then work out how we will present the building. Hazle will look into the history of the building, sometimes a shop can have changed ownership many times, and housed a number of different businesses over the years. Sometimes our collectors ask for a particular business, and if it fits the building, we will paint it that way. So if there is a business you think your High Street is lacking, email us, all suggestions very welcome! One suggestion that really appealed to Hazle is to present this building as a chandlery! There is a busy Marina nearby, and tourists to the area often choose to take a boat trip along the river. There are plenty of ‘weekend’ sailors who moor in the area, and a large selection of different craft, from canoes to narrow boats to cruisers can be seen along the river. So here we have Hazle’s first draft of how this pretty little shop could look stocked with everything you would need afloat! It is still a work in progress! 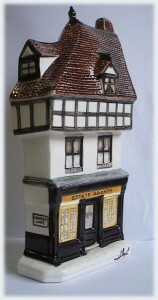 No doubt the finished ceramic will also feature signage, or goods for sale stacked above the shop sign alongside the first floor windows, we will have to wait and see! 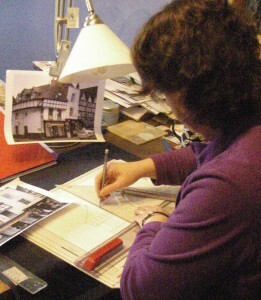 But as Hazle is currently working all hours on the Royal Wedding sets, we may have a couple of weeks (or more!) before we see the finished piece. Our new piece is finished and ready to be presented to the world! And here it is, The Chandlery by the river. 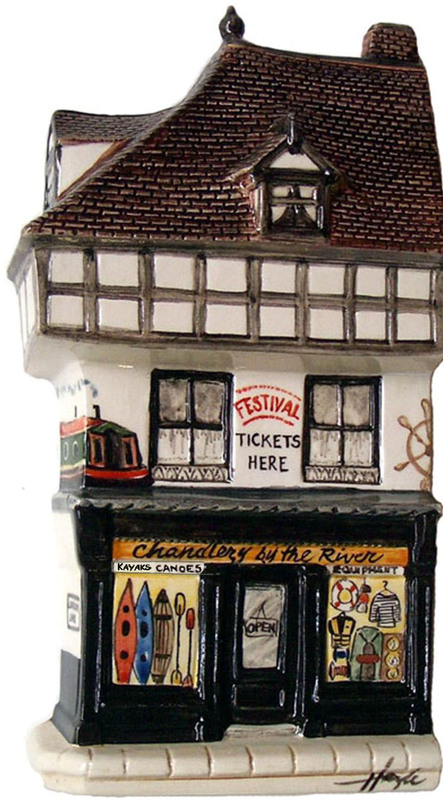 With beautiful detailed windows showing canoes, kayaks, lifejackets and more, and alongside the first floor windows we see this little shop also sells festival tickets, and is probably owned and run by a lover of narrowboats. We hope you have enjoyed following the progress of this newest addition to our collection. Back in January when Hazle first drew up a shortlist of possible buildings to model, this building seemed just perfect to join our Nation of Shopkeepers range. We’ve been on a long journey with it since then, and today we will be putting the first ceramic on display at our workshop. But keep watching this space, Hazle has been on her travels again, and has photographed several more buildings that she would love to model…… If there is a building you would like to add to your collection, get in touch! All ideas very welcome.